As a specialist for high-pressure technology for up to 25,000 bar, we make the extraction of crude oil and natural gas efficient and safe – with high-performance products, single or multi wellhead control panels, hydraulic power units and high-pressure systems for testing and production purpose in surface and sub sea applications. Maximator has developed and produced high-pressure and testing technology, hydraulics and pneumatics for more than 50 years. We supply high-pressure components as well as innovative and customized system solutions, like wellhead control panels, hydraulic power units and workshop test equipment that meet the strict standards typical for the industry. Our flexible organizational structure means that we are able to realize complex projects in an efficient and professional way. We are also equipped to accommodate time-critical modifications resulting from changes to standards and laws, because as a manufacturer with wide-ranging engineering experience in numerous sensitive industries, we are very familiar with these issues. Our interdisciplinary solution competence, our systems and our products push the limits of technical feasibility ever further. With more than 600 employees across the globe, we offer support to reputed international companies from the following sectors: oil and gas, automotive and suppliers, chemicals, mechanical engineering and energy. Hydraulic wellhead control systems for surface and subsea production systems through to high-pressure testing equipment - we develop made-to-measure solutions to make your processes and your applications more efficient, more reliable and safer. All systems are designed for maximum reproducibility of the results, simple operation, speed and efficiency – even in difficult environments. We consistently train our employees and we implement intelligent safety concepts in our systems and in our technical solutions, because human and environmental safety is one of our main priority. We adapt the Customized Wellhead Control Systems to suit the requirements at the installation site, and to accommodate the functions that need to be controlled, the communication with the production systems and the applicable standards and guidelines. In the design process, we take into particular account the size of the wellhead equipment, especially for reasons of safety. The design is based on application techniques to ensure that our Customized Wellhead Control Systems are equipped for the respective tasks - also for mobile applications. High pressure homogenizers are used for many applications in the biotechnology, pharmaceutical, cosmetic, food, and environmental industries, where it is necessary to reach particle sizes in a nano range. The Maximator high pressure homogenizer HPL6 is designed for energy-efficient, continuous production of superfine emulsions. The HPL6 system achieves the homogenizing effect by means of fully adjustable decompression of the liquid from max. 4200 bar to an ambient pressure. 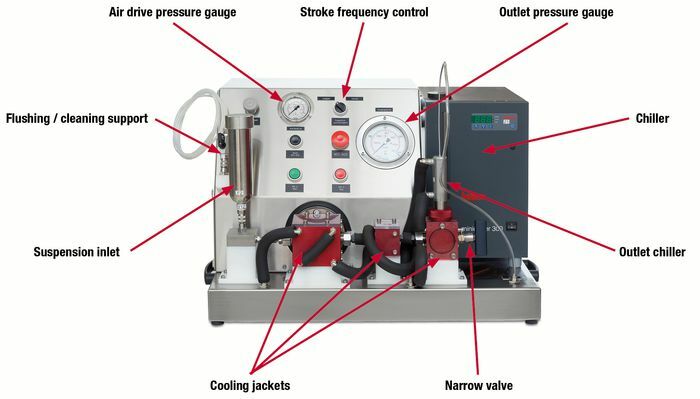 The high pressure homogenizer uses a Maximator air driven high pressure pump to pressurise the suspension / liquid. The required pressure for the homogenizing process can be easily pre-set by means of adjusting the air drive pressure from 1 to 10 bar. In order to achiev the best possible homogenizing results, a Maximator high pressure micrometer-needle valve is used as homogenizing valve and allows the user to adjust the gap in an extremly precise manner.